Whether you’re a fan of J.K. Rowling’s Wizarding World or just a movie buff, the premier of Fantastic Beasts: The Crimes of Grindelwald last week had everyone talking. If the cliffhanger ending left you baffled (plot twist alert! ), you’re not alone. Like you, we weren’t satisfied either. To fill that void, we dove into the world of unusual eats on the hunt for something to curb our cravings. Join us as we discover Fantastic Feasts in Singapore and where to find them! Forget about the classic soya bean milk and you tiao: dip those fried dough fritters into creamy pumpkin soup infused with fish sauce and lime juice at CreatureS instead. Not your typical combination, but still worth a try! Located within the rich heritage area of Little India, this charming two-storey space churns out MSG-free comfort food with a local twist. Want 35% off your meal? Purchase your voucher here. What used to be a bicycle shophouse is now a polished and industrial chic restaurant and bar. More than just your usual cafe grub, The Palmary takes it up a notch by combining Asian and European cuisines and adding a touch of class to their dishes. Look forward to innovating fusion dishes such as Bak Kut Teh-flavoured Duck Breast and Portobello Mushroom Risotto with Century Egg. Complete the night with a Matcha Sour, their signature smooth and tangy cocktail with an unusual combination of gin, lemon, egg white, and matcha. Want 30% off your meal? Purchase your voucher here. We all love a perfectly charred unagi, but have you thought of pairing it with Egg Benedict and Yuzukosho Hollandaise sauce? Served between flower buns and mushrooms, it’s an unusual combination that we can’t seem to get enough of. We’re still not over the truffle craze, maybe you could give the Half Truffle Roast Duck a shot. That’s not all: there are locally-inspired cocktails like Milo Dinosaur, Yakult, and Yuan Yang that are ready to give your meal a twist! This is a quirky spot with modern Asian flavours that you can’t miss. Want 10% off your meal? Purchase your voucher here. Located at Holland Village, this hip restaurant serves up classic Cantonese dishes that will leave you wanting for more. 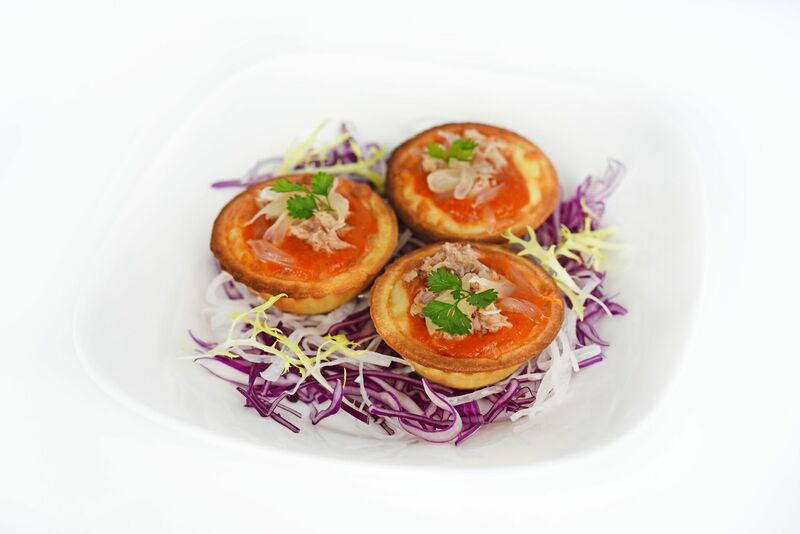 Be adventurous and give the Chilli Crab Cheese Tart with Pomelo a shot, even if it sounds a little bizarre. As strange as these dishes may get, Full of Luck is a lively place where friends can gather and catch up over a hearty meal. Looking to experience a whirlwind of East and West flavours? Redpan will bring you on a gastronomic journey through mind-boggling fusion fare like “Bak Chor” Foie Gras Pasta and ‘Lup Cheong’ Iberico Chorizo Paella. End off with the recommended Durian Baked Alaska to fulfill your exotic durian craving. Stateland Cafe offers East Asian fusion dishes that seamlessly combine cafe grub and our local hawker favourites, which include the likes of Hainanese Chicken Rice Risotto and Kimchi Carbonara. If you’re a fan of fried chicken and waffle and Korean cuisine, you’ve got to try the Korean Fried Chicken Waffle. With nothing but good vibes, delicious food, and aromatic coffees on offer, this may just be your next staple hangout. Sign up for the Chope newsletter for top deals, new restaurants and more delivered straight to your inbox! I am not a glutton, I am an explorer of food. Always on the hunt to find the best hawker food, cafes, bars and restaurants in town.